Calls for London to secede from UK, remain in EU. Two million sign petition calling for second referendum on Brexit. 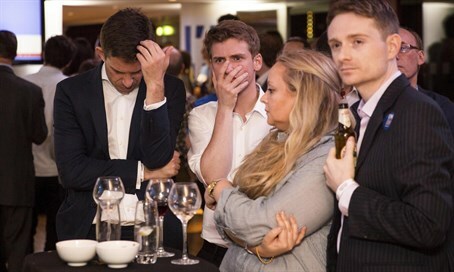 Despite having lost Thursday’s vote on a ‘Brexit’, millions of supporters of the campaign to keep Great Britain in the European Union are refusing to concede defeat, with more than two million calling for a do-over. By Saturday over two million Brits signed onto a government petition demanding a new referendum. Traffic on the UK’s official government petitions website was so high that the site crashed on Friday. An additional petition, calling upon London Mayor Sadiq Khan to declare London independent of the UK and apply to become a member of the EU, has also passed the 100,000 signature threshold requiring parliamentary debate on the subject. Thursday’s referendum saw surprisingly high turnout, with more than 72% of eligible voters participating, the highest level in a national vote since the 1992 general election. With a total of 33.5 million votes cast, ‘leave’ won with nearly 51.9% to 48.1% for ‘remain’. Supporters of a second referendum have argued, however, with turnout under 75% and the margin of victory less than 20%, “there should be another referendum”. There is no indication, however, that Britain’s political establishment is considering moves to block ratification of the plebiscite into law. While the referendum is not legally binding, observers have suggested that attempts at the parliamentary level to block the Brexit’s implementation would be politically disastrous. On Friday Prime Minister David Cameron (Conservative), who had vociferously opposed the UK’s departure from the EU, pledged to step down from his position. Tory MP Boris Johnson, who previously served as London’s mayor, is seen as Cameron’s most likely successor. Johnson was a staunch supporter of the ‘leave’ campaign. Labour chief Jeremy Corbyn dismissed calls to block the Brexit with a second referendum, saying it was time to “accept that decision.” Corbyn, who had been an outspoken supporter of a Brexit for decades prior to the vote, nevertheless endorsed ‘remain’.